For some reason this post doesn't seem to work right. 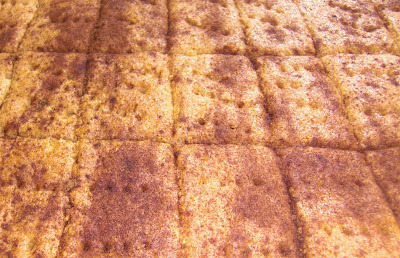 Here is the recipe for homemade graham crackers. Mix dry ingredients. Add remaining. Mix until well moistened. Roll out 1/8” thick on greased and floured baking sheet (without sides is best, or just turn one with sides upside down). Score into desired size. Sprinkle with cinnamon, if desired. Prick with fork. Bake at 350 for 8-10 min, or until golden. Longer for crisp crackers. Makes 3 large trays. Sometimes I even take them off the sheet after they are done cooking, flip them over and put them back on the tray upside down and cook some more. That way they are really crispy. Thanks for posting this, I was just about to ask you for this recipe. I love your recipes, and your blog.